Sun Frost has established a progeny record of over $2,000,000 in earnings with outstanding perfomance horses that includes 'Bozo', 1994 and 1996 WPRA World Champion and many others in roping, barrel racing, working cow horse and cutting. Although unraced, Josephine El has three siblings that were AAA and she herself is the dam of a Race ROM foal. Pat Cowan - Per 9.0 Dam of AA SW, ROM Race, DNCFR Barrel Champ, BS Champ, B Fur. Champ, Cutting Champs, Working Cowhorse Money Earners. AA, ROM Race-ROM Arena 1952 ROM Roping. Sire of ROM Race & Arena/Hi.Pt.Perf/Pro.Dghts. He was sometimes called the Cyrano de Bergerac of horses because of his ears being frozen off. 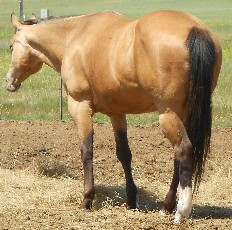 AAA ROM Race,Sire of ROM Race/ROM Arena, AQHA Chs/Pro.Dghts. Nothing I don't like about this mare!